After visiting the lower antelope canyon, we drove just about 10 minutes to get to the horseshoe bend. We arrived at a fairly large dirt parking lot and despite the crowd of people were able to find parking. The hike to the horseshoe bend is just half a mile, then it's another half a mile back. So in total it's a short one mile hike and totally worth it! The horseshoe bend is a horseshoe-shaped meander (bend) in the Colorado river. It is also a part of the Glen Canyon National Recreation Area. There is so much to do in this area and I unfortunately had no idea until now. Here you can explore other cool features and areas to check out when visiting this area. I really admired the color and details of the outer rock walls. These rock walls contain a variety of minerals such as hematite, platinum, and garnet. Sooo beautiful!! I may look brave but quite honestly I was very nervous taking all these pictures. The drop is 1,000 feet...so be careful if you ever visit!! There was a group of people who wanted to take a jumping picture on one of the edges like this one. I agreed but I was sooooo terrified for their lives! I kept telling them over and over to be careful...I probably sounded like an overprotective mother and I didn't even know these people! Thankfully these people remained safe and they accomplished a successful jumping picture. I give them props because they are brave! I said forget the cool pictures, I'm just going to sit haha! 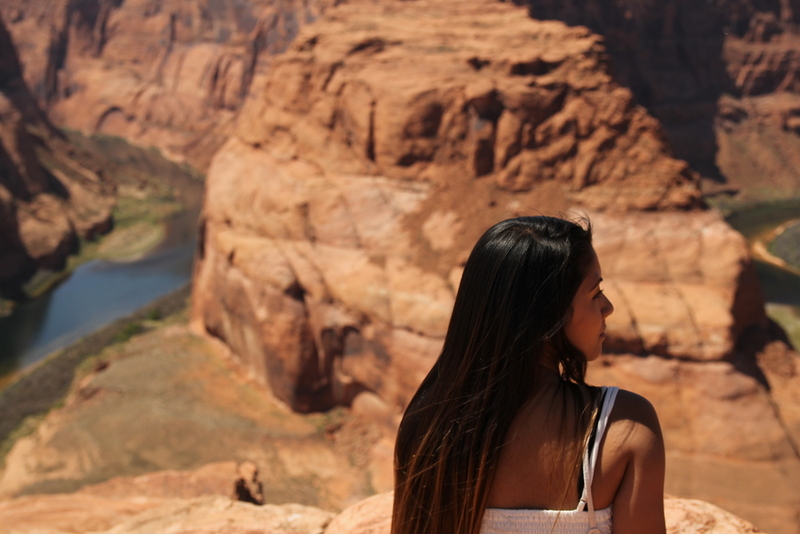 Address: US-89, Page, AZ 86040 - You'll see a sign that says horseshoe bend to let you know you have arrived! If you haven't already, check out part one and part two of my Arizona road trip!